Wrangler, a first-crop Laoban colt, gets acclimated to the sales grounds prior to the Fasig-Tipton Saratoga Fall Mixed Sale. 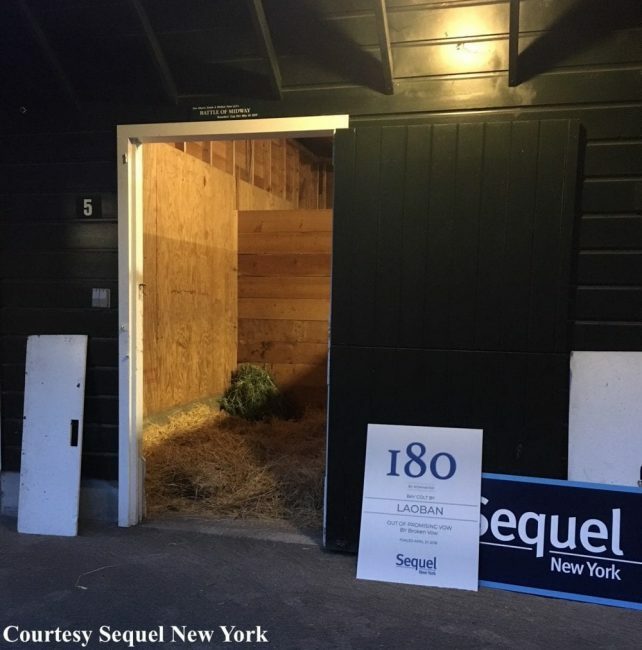 Friday was a big day for Wrangler, the colt from the first crop of Sequel New York stallion Laoban who shipped to the sales grounds to represent his sire at the Fasig-Tipton Saratoga Fall Mixed Sale. As Hip 180 in North America's first major mixed sale of the season, Wrangler and his contemporaries will set the pace in establishing the commercial prospects of Laoban, a Grade 2-winning son of Uncle Mo. Laoban has 20 weanlings cataloged to the Saratoga Fall Mixed Sale before outs, more than any other stallion in this year's auction. The colt, named after the Wrangler Stables partnership of Sequel's Becky Thomas and Lyn Burleson of Burleson Farm, is out of the placed Broken Vow mare Promising Vow. Wrangler, along with the other weanlings in the Sequel consignment, took the 75-mile van ride from the farm to the sale grounds Friday morning. In the coming days, he will be in and out of his stall, showing off what he's learned on the farm as he stands and walks for potential buyers between Barns 2 and 6. The colt will go through the ring on Monday, Oct. 15. In the latest edition of this series, we touch base with Sequel's Becky Thomas and Teri Brown after Wrangler shipped in to talk about putting the finishing touches on his sale prep and the shipping process. Brown: Wrangler's coming along nicely, growing and gaining weight. He has a nice, cooperative demeanor especially for a weanling. A very smart “kid” and mature for his age. Thomas: He took his weaning not terribly hard, but I would rather him be carrying a little more weight. It's so early in the process, being as though he was weaned last month, to be able to look his very best. Brown: When it comes to teaching weanlings how to show themselves for buyers, short frequent sessions work better than fewer, longer ones. We maintain a routine as the sale gets closer instead of changing the intensity, as change is harder for them to handle, so things pretty much the same. Wrangler is a “thinker” and reasonable, not flighty or aggressive, which makes working with him a pleasure. Thomas: It's really like your own fast track on the conveyor belt to teach them all these things as weanlings. The best thing about a baby like Wrangler is when they're pliable. They want to please, so they're trying to do what you want them to do. He's got a really mellow personality, so it's like, “You want me to walk?” You start out teaching them how to walk with a hand on their shoulder and tapping them along, but you can tell by his walking that he knew to move from his shoulder from the time we taught him a couple lessons. He's been great. Some of them are just really good students and want to get an “A” in the class. Wrangler's awaiting stall early Friday morning prior to the Fasig-Tipton Saratoga Fall Mixed Sale's show days. Brown: We stay as consistent as possible on ship-in day. He will get his last bath the day before departure, so he'll just get a light breakfast and grooming the morning he leaves. The horses are handled regularly and usually are willing to load without much ado. Thomas: What we do is we ship them with a mild tranquilizer, and ship them two to a box so they've got a buddy right there. They've never been shut up in a box that's that small. You try to take the edge off of them, kind of like a person that's flying that's nervous and has taken a lone Xanax. We load them up with a friend so they're a little less excited when they get there, and then they're moving along and they've got company in the same box with them. It makes for a much easier ride and much less chance for any kind of trauma. It's very exciting for all because there's a lot of activity. We have a larger consignment at Fasig-Tipton, so we always get the spot that has the courtyard and it's kind of our own nook over there. We're blessed to be able to show where there's no other people but us. Our sales crew is a crew that I use at my 2-year-old sales and they're absolutely amazing. 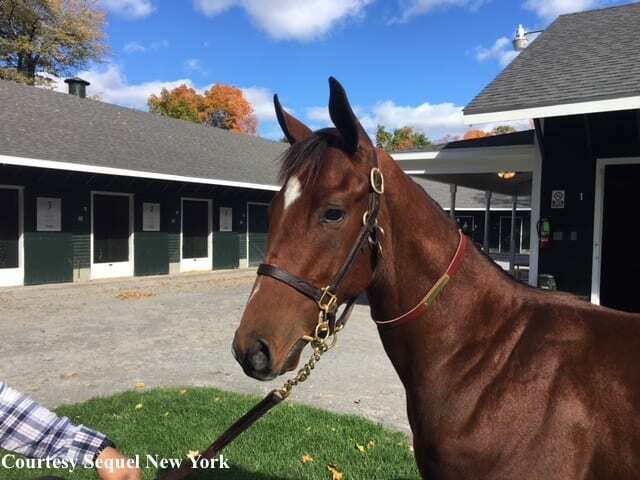 This entry was posted in Bloodstock, Features, Follow A Foal, NL Article and tagged Becky Thomas, fasig-tipton saratoga fall mixed sale, Follow a Foal, laoban, Promising Vow, teri brown, Wrangler by Joe Nevills. Bookmark the permalink.